My Lord, Please Sanctuary Me: Who is in Charge? Most of my friends are women with which I have a few things in common: different friends, differing things. The one thing I do not have in common with a majority of my friends is my rather strong interest in politics. This is something I have mentioned on my blog before, but I rarely make my politics known here. I am mindful that these things are of the world and my true home is in the Kingdom, so these things will not be of lasting value to me someday in future, however that can be said of nearly all our daily concerns and while I am here on this earth as it is now, I will continue to be politically minded, because what we do here counts not only to those who continue here after we have left, but also to my Lord. I was talking with one of my not-politically-minded friends about voting in the primaries this month, hoping that she would consider how Common Core in our public schools is a major issue affecting her very own daughter's education and that we have the opportunity to select candidates for the governor (the governors were the push to get 44 states--was 45 but Indiana pulled back out in March--to accept Common Core with the golden carrot of federal grant money), the state school superintendent with several people running (at least half against Common Core in the conservative party), and three school board members in our county. There is much to research about each candidate because a speech is not a politician in action once he has taken office, but that is why staying involved in our communities and seeing the effects from other points of view of laws, codes, and ordinances passed help us understand for every new rule there is a downside, not all that we think is good is good for all. We should question our leaders, make our concerns known, and protest when necessary to be heard and make others aware. That brings me to another hotly debated issue in our county: the airport. A group of influential business people want it to become commercial with passenger flights, which we were originally promised it would never be. This airport--only six years old--well, they just cannot leave it be because they changed the name this past year. Now it is named after a 60-mile walking-bike trail running through three counties that was originally a train railway and named after a passenger train--No kidding, an airport named after a trail named after a train. This airport is located between my friend's house, which is near our church about 20 minutes away, and mine. Surrounding it now is forests, farm land, and small subdivisions out away from the cities where people cherish the quiet life...including my friend. Still, when I discussed these things with my friend, her response was that she does not vote unless it is a big election, like the president of the U.S. (which is not determined by poplar vote anyway), because as she sees it "God is in charge." It just did not sit well with me, although I told her I understand her viewpoint and I really do, but I have a different viewpoint about how God's being in charge works. I believe absolutely that God can do anything, that is why I get so disappointed when He does not do what I have prayed for, but the flipside is how God does what He does. Most often even the most maraculous miracles have a human element involved, someone who did not just sit back and say God is in charge, but someone who acted on his belief that God is in charge so His works could be done through that very someone. Imagine if Jesus had said God is charge instead of actively working in His ministry or saying God is in charge in place of saying with faith we could command a fig tree to wither and mountains to move as He did in Matthew 21: 21-22. To the blind and lame, did He say "God is in charge" or "be healed?" We, who live in countries where we have the right to vote for our leaders, should not only do so to honor the freedom other people died and suffered to protect, but to honor our Lord who taught us more than anyone on earth that we can move mountains...when we go out to purposely move mountains. 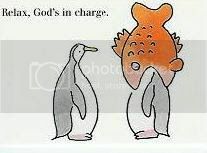 God most definitely is in charge, but the real question: is He in charge of you? That is where He starts. I'm with you friend, I hate when people tell me they don't vote because God is in charge. Just because God is in charge doesn't mean we are excused from doing our part! God is in charge yet he still tells us to go out and minister to others, and to witness to the unbelievers, sure he could do it himself and bring them in to his fold without us but he chooses to use people. We must take our part seriously, as God expects us to do what we can and then he will do the rest.